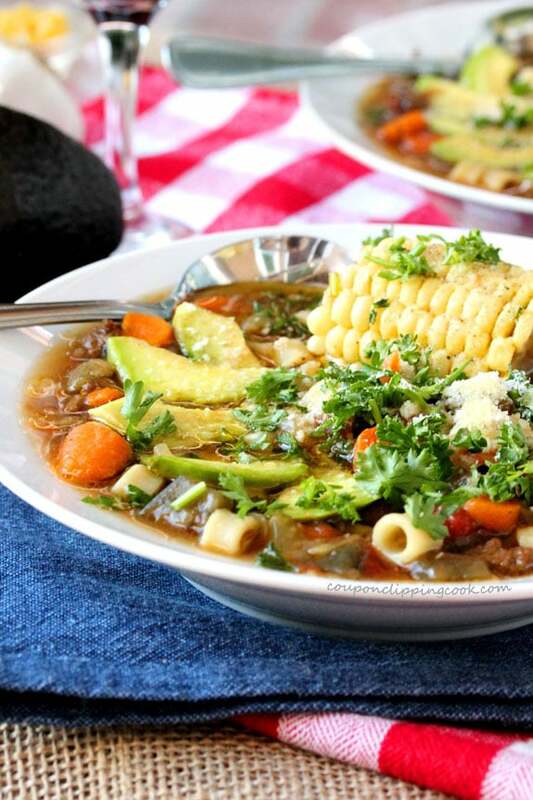 One of my very favorite go-to comfort food meals. 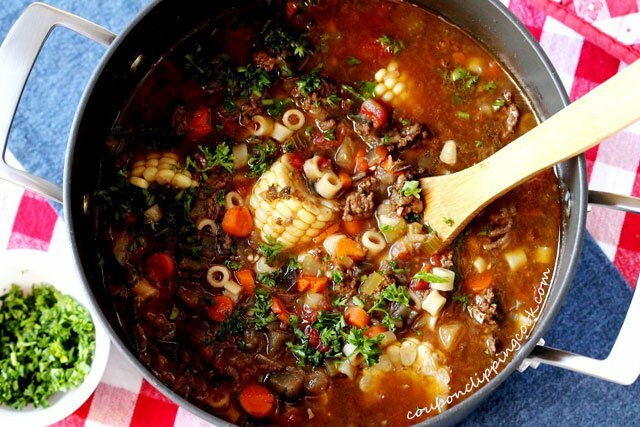 Although this soup is hearty with ground beef, veggies and pasta, it still tastes light. It tastes delicious by itself and when topped with fresh sliced avocado, fresh parsley and grated Parmesan cheese it’s even better. 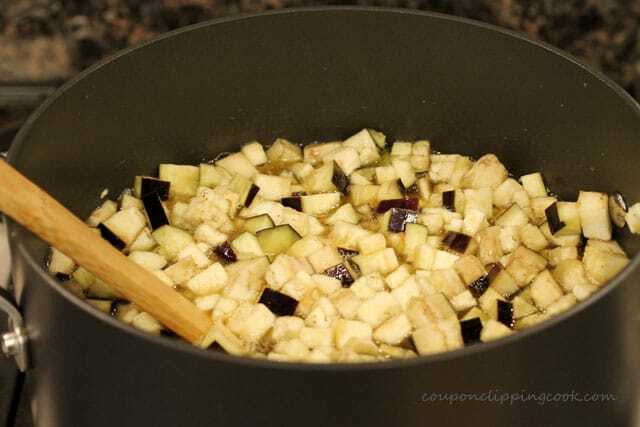 This eggplant soup is one of my favorite go-to dinners and to me it tastes just like comfort food. 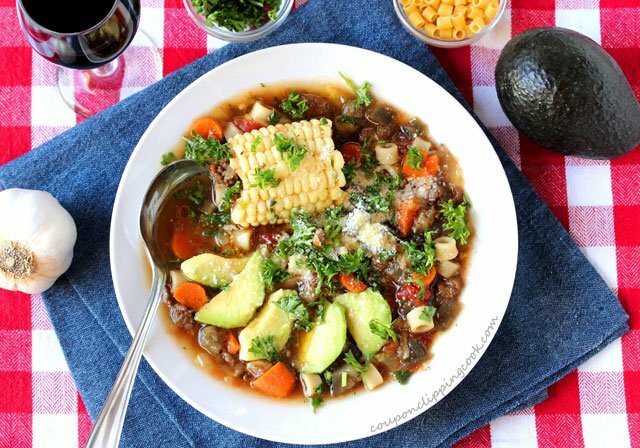 And the good news is that leftovers can be frozen (minus the avocado and corn on the cob). I purposely make extra so I can keep it in the freezer when I don’t have time to cook or just want to put my fuzzy slippers on and have a nice warm bowl of homemade soup for dinner. 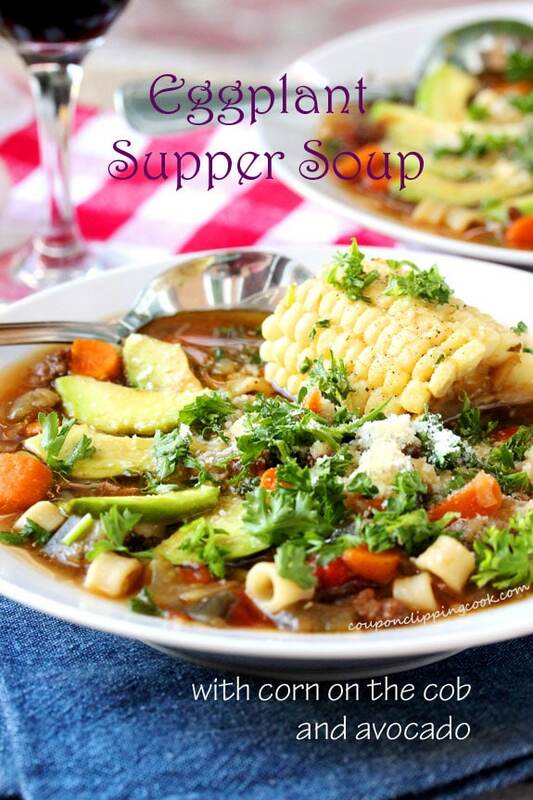 It’s also the perfect soup to give as a gift to a friend or relative when they’re sick or even just because. Recently my friend had a horrible cold so I made her a big pot of this soup. After cooking the soup, I put it in one of those big blue speckled soup pots with a lid and delivered it to her front door as a surprise. Then just before driving away I texted her and told her to check for a surprise outside of her door. She loved it and it seemed like every night for a week she texted me a picture of the bowl of this homemade soup she was having for dinner. We joke that it has healing powers because she started to feel better after eating it. 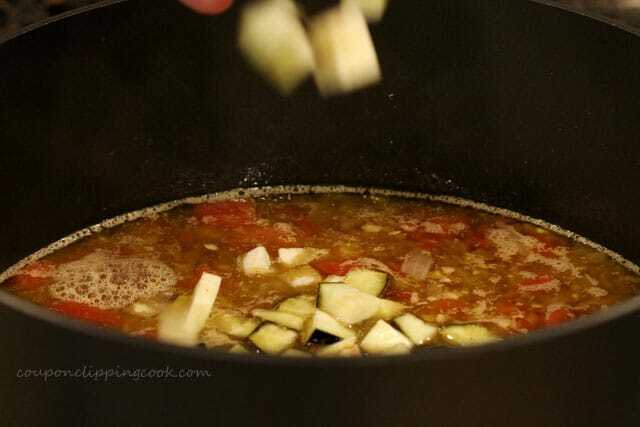 Here’s the version of Eggplant Supper Soup that I made for my friend. 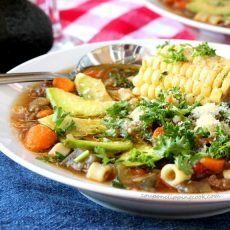 It’s every bit as delicious as this version with just a few things that are different; it doesn’t have the avocado or corn on the cob. It also has a bit less garlic and parsley, and the skin is peeled from the eggplant which makes the soup a slightly lighter color. Regarding the Timing of Serving this Soup – This soup has salad macaroni (diti pasta) in it which is the last ingredient added to the soup. 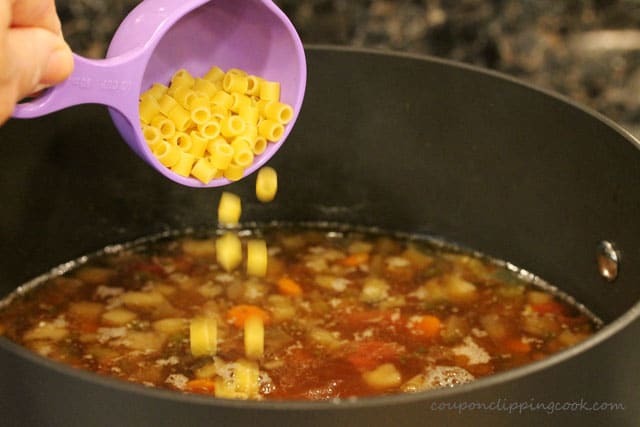 The macaroni pasta tastes best when it’s cooked al-denti (firm) so when making this soup, don’t add the macaroni until 25 minutes before serving it. Otherwise, the pasta will continue to cook and turn soft if its left in the pot to simmer further. 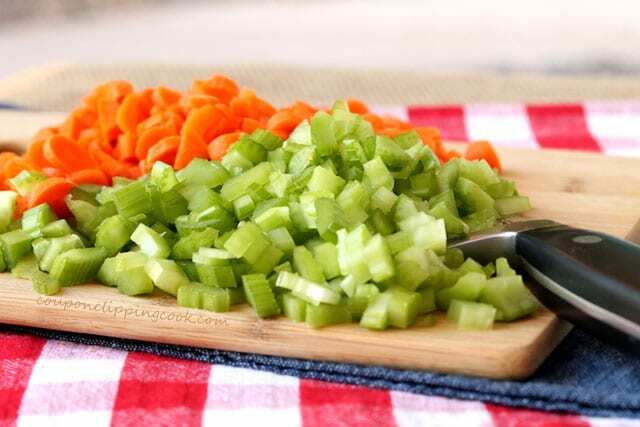 …celery and carrots. Set aside. 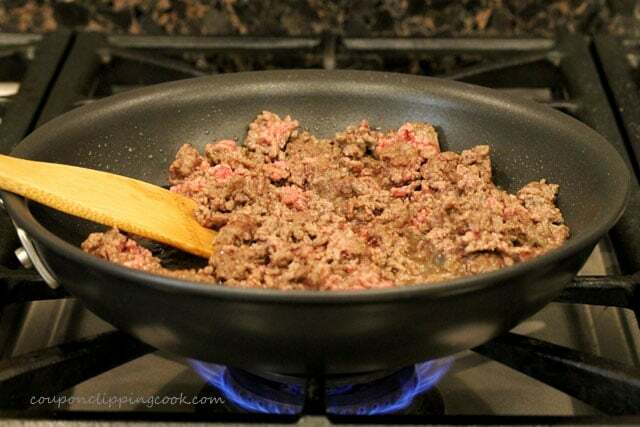 Heat a medium size skillet on medium heat and add the ground beef. 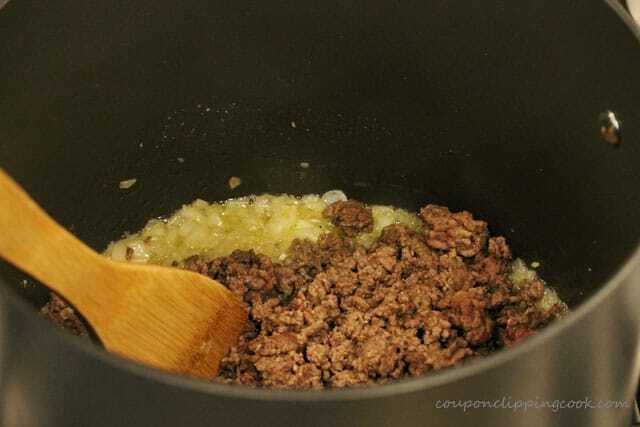 Continue to stir and break up the pieces of the ground beef so they’re all about the same size. 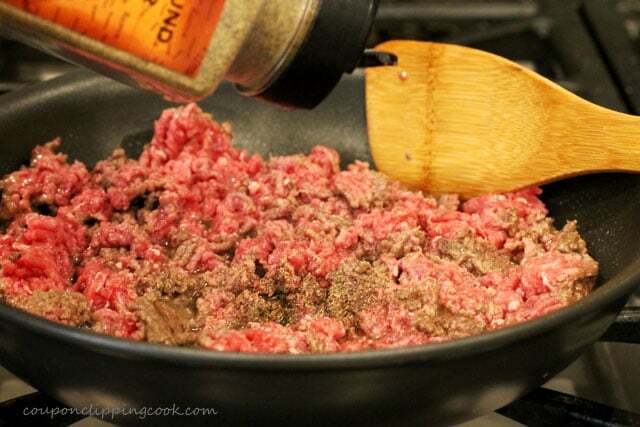 …the ground beef is cooked through. 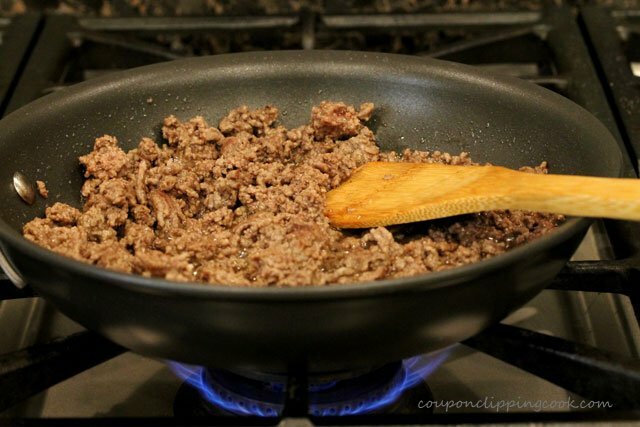 Transfer the ground beef to a paper towel-lined plate and set aside for a moment. …garlic. 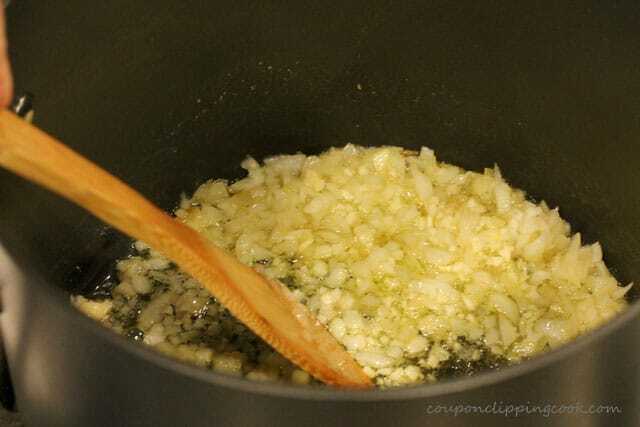 Continuously stir so that the garlic doesn’t brown. 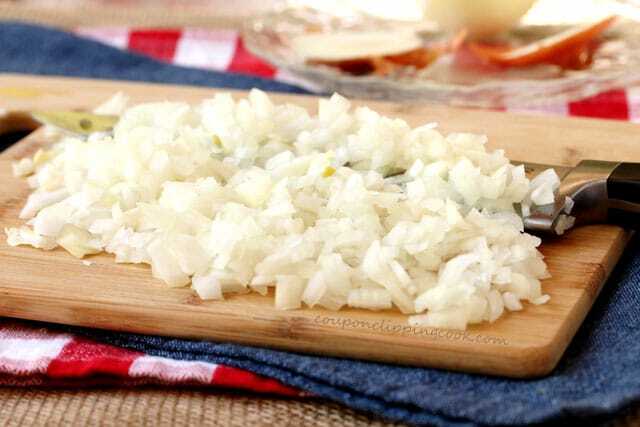 Let cook (while stirring) until the onions start to turn translucent (about 4 or 5 minutes). 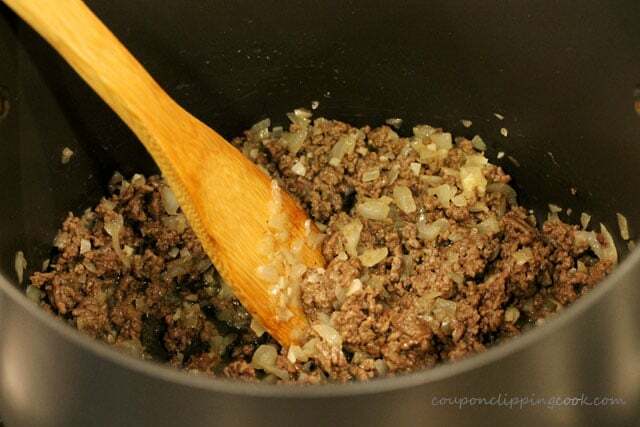 …add the cooked ground beef to the pot. Next, add the carrots and celery. Stir together and let cook for 5 minutes. 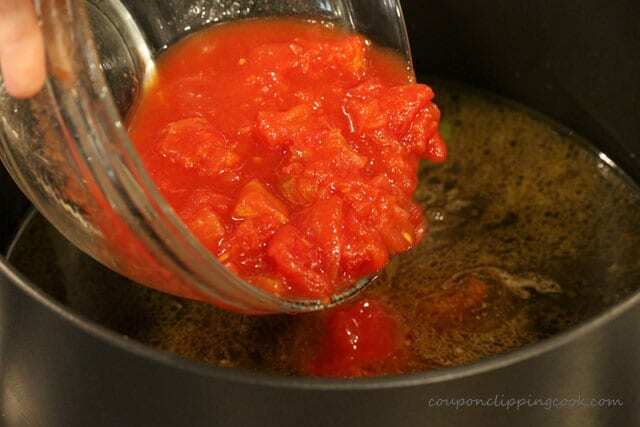 Pour the canned tomatoes in a medium size bowl, and with clean hands smash them with your fingers. Then add the tomatoes to the pot. …and add water. 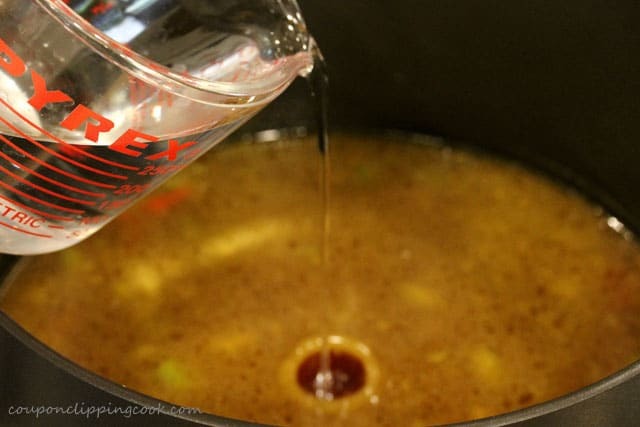 Let the soup cook until it starts to bubble, then turn the heat to low. 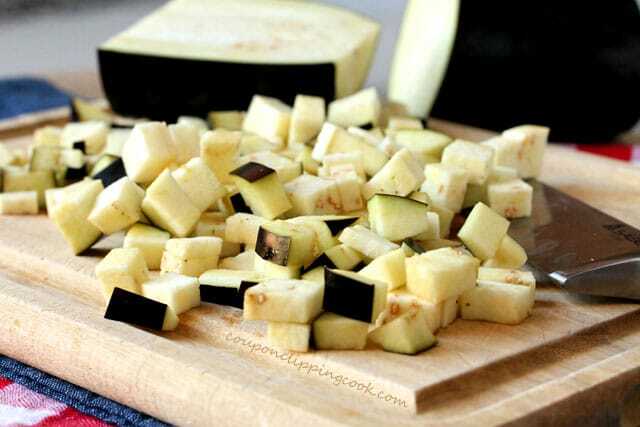 While the soup is simmering, chop the eggplant (with the skin on). …pepper. Stir together. 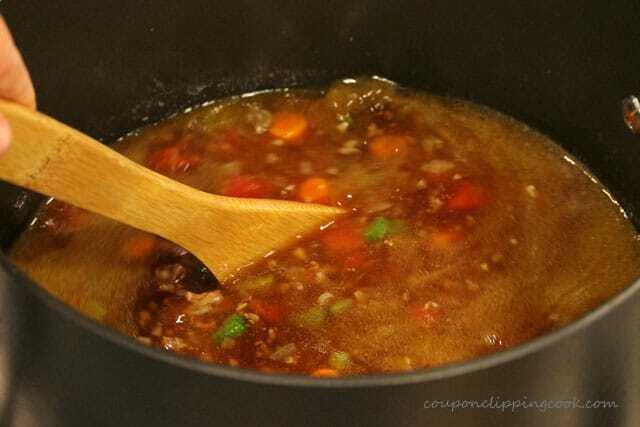 Let the soup simmer for at least 30 minutes. Stir occasionally. 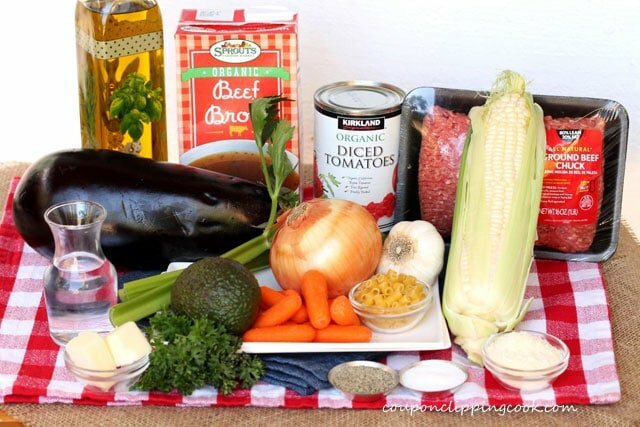 When to add the macaroni – About 25 minutes before serving, add the salad macaroni. TIP – The macaroni pasta tastes best when it’s cooked al-denti (firm) so don’t add the macaroni until 25 minutes before serving this soup. Otherwise, the pasta will continue to cook and turn soft if its left in the pot to simmer further. 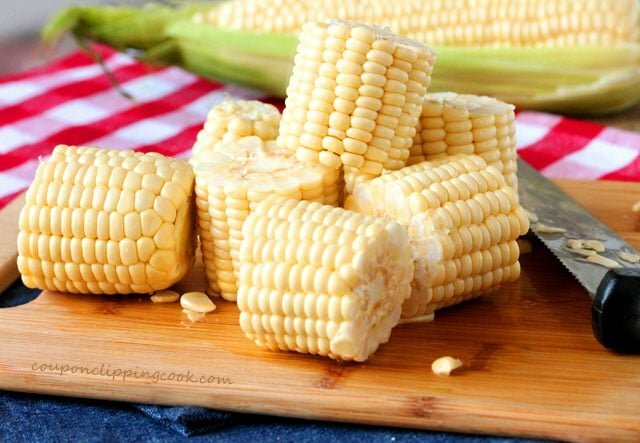 Cut each corn on the cob into quarters. 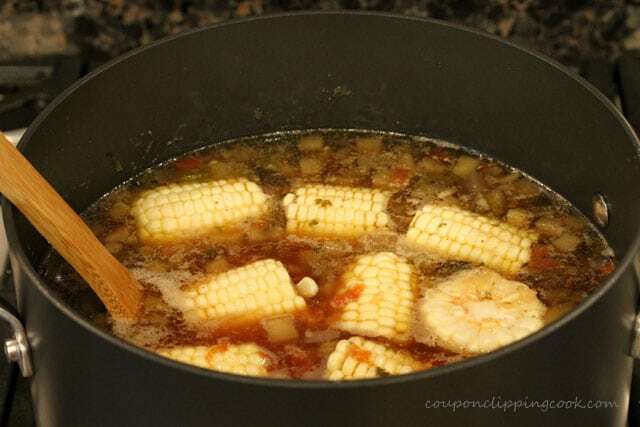 When to add the corn on the cob – About 20 minutes before serving, add the corn on the cob to the soup. do a taste test and add more salt if needed. For my taste buds, I’ll generally add more salt at this stage. 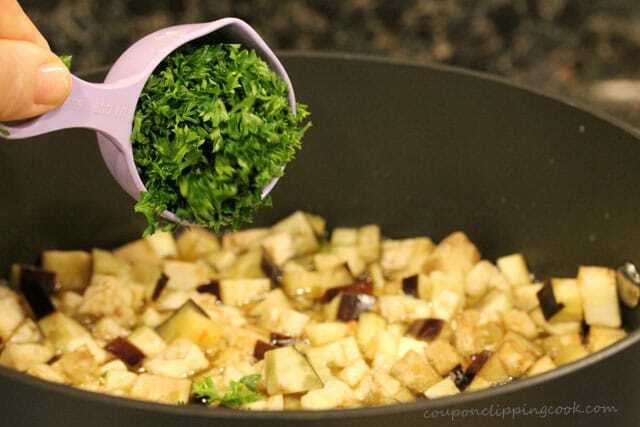 If serving right from the pot, garnish with parsley. Slice a whole avocado in half, remove the pit (squeeze the half piece with the pit slightly and the pit should come loose). 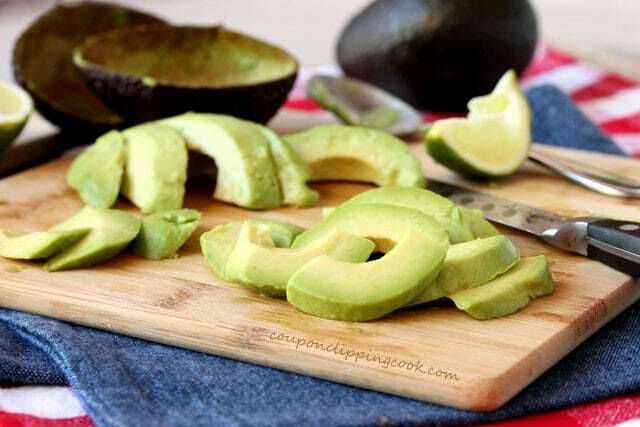 Scoop each half of the avocado out of the skin and cut it into slices that are about 1/2 inch thick. Serve the soup while hot in serving bowls. Top with slices of avocado, and add one to two pieces of corn on the cob depending on the size of serving bowls used. 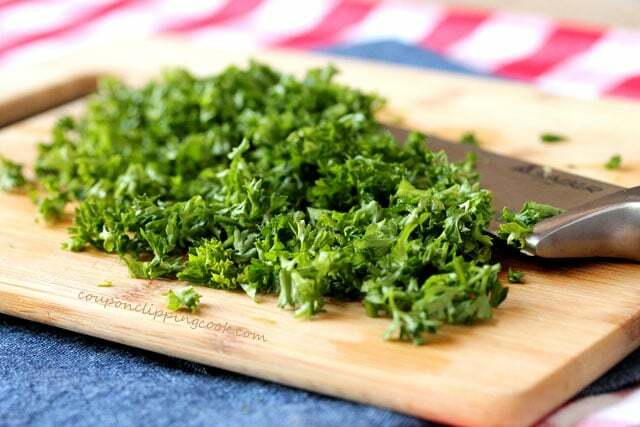 Garnish with parsley and grated Parmesan cheese. 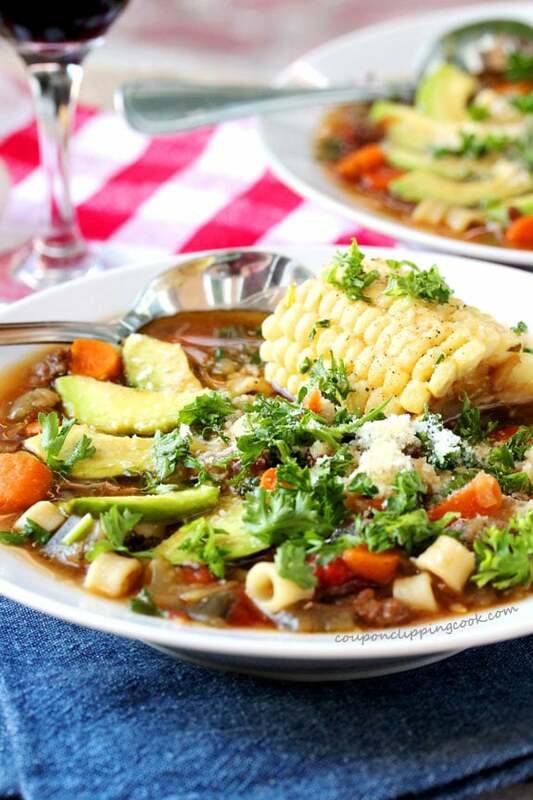 One of my very favorite go-to comfort food meals! 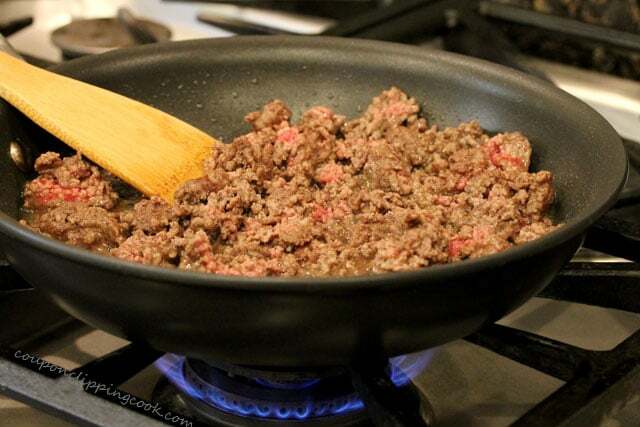 Heat a medium skillet on medium heat and add the ground beef. Stir and add pepper. 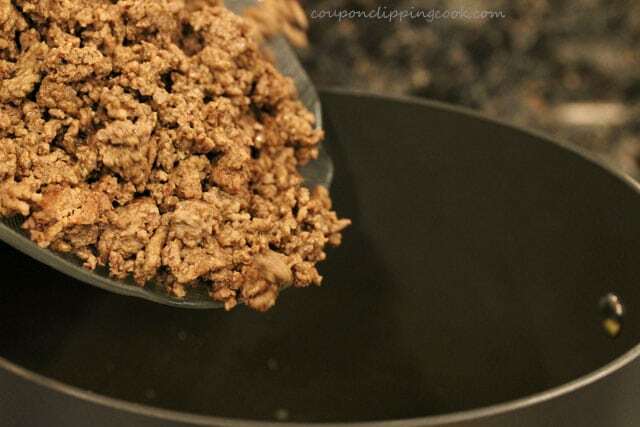 Continue to stir and break up the pieces of the ground beef so they're all about the same size. 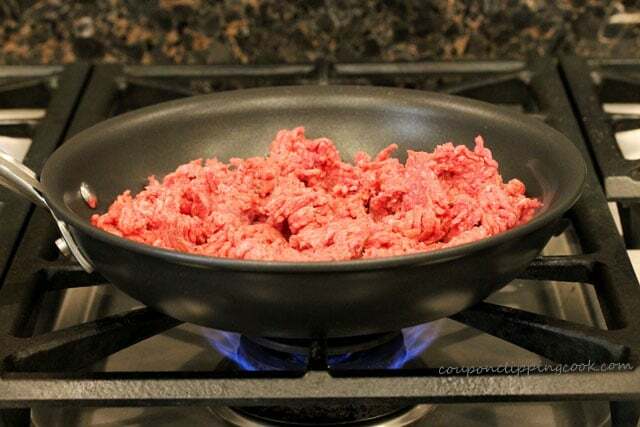 Let cook until the ground beef is cooked through. 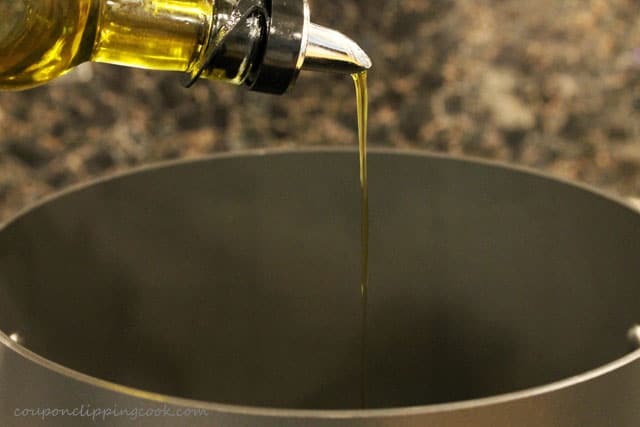 Heat a large-size soup pot on medium heat and add olive oil and butter. 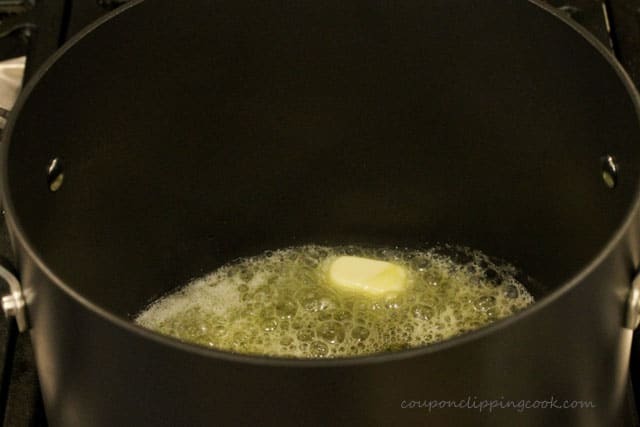 When the butter melts, add the onion and garlic. 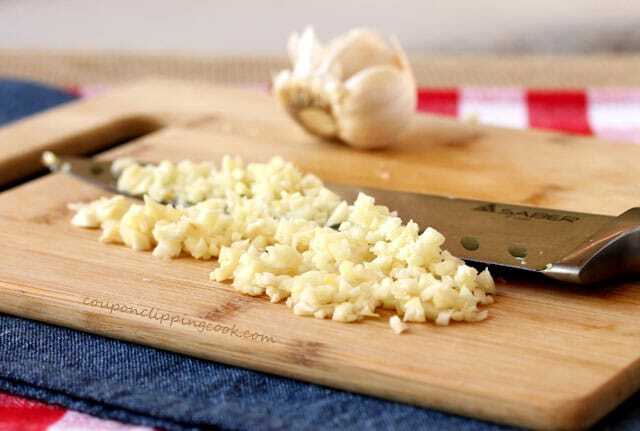 Continuously stir so that the garlic doesn't brown. 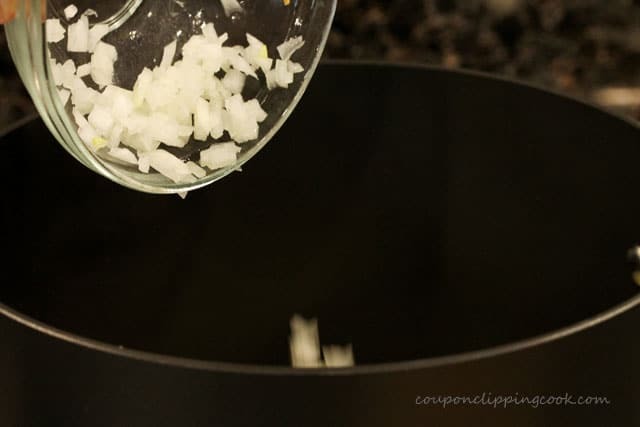 Let cook (while stirring) until the onions start to turn translucent (about 4 or 5 minutes). 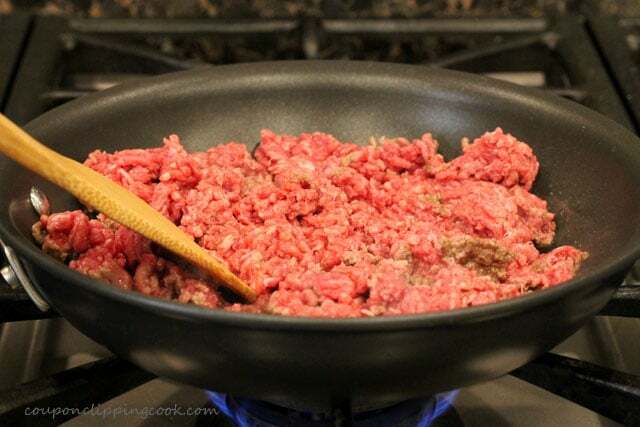 Add the cooked ground beef to the pot. Stir together. 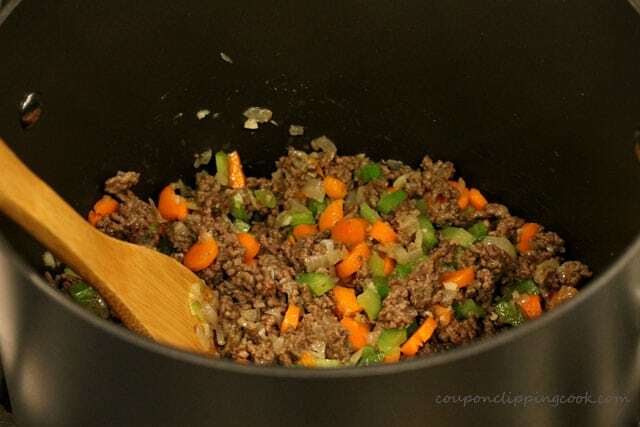 In the soup pot, add the carrots and celery. 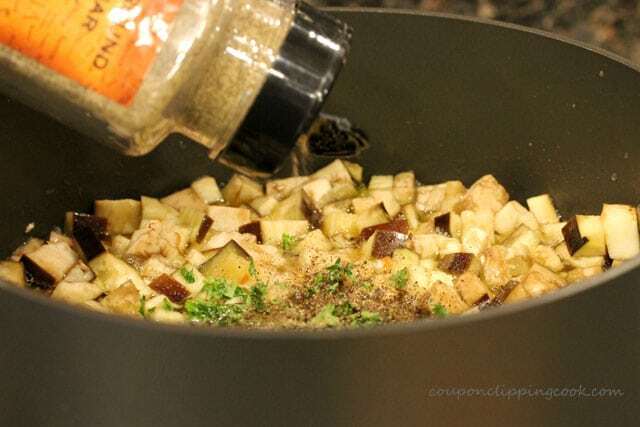 Stir together and let cook for 5 minutes. 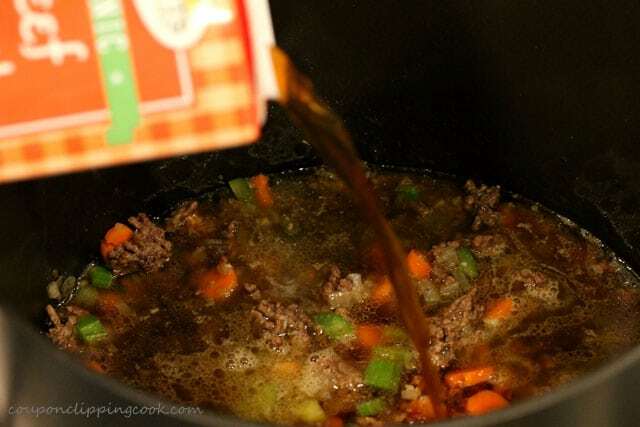 Add the beef broth to the pot. In a medium size bowl, add the canned tomatoes and with clean hands, smash them with your fingers. Then add them to the pot. Stir together. Add the water to the pot and stir. Let the soup cook until it starts to bubble, then turn the heat to low. 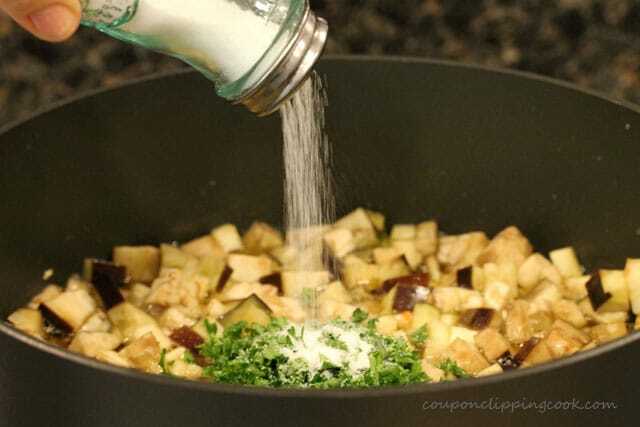 Add the eggplant and stir. Add parsley, salt and pepper. Stir together. 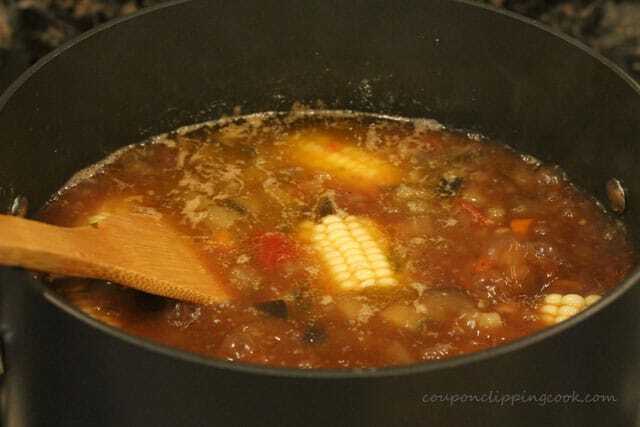 Let the soup simmer until the eggplant turns translucent (about 40 minutes) before adding the pasta and corn. Stir occasionally. 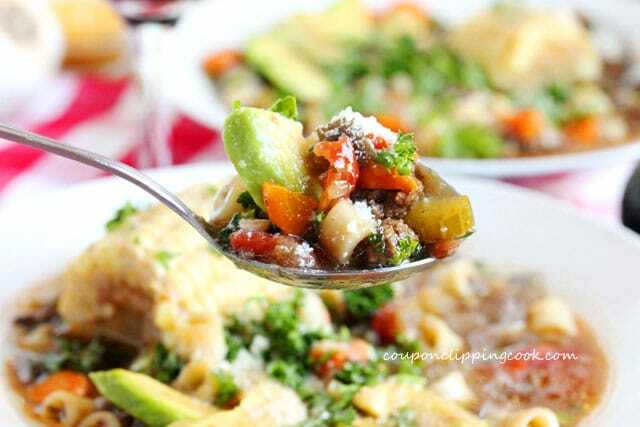 When to add the pasta - About 25 minutes before serving, add the salad macaroni and stir together. The macaroni pasta tastes best when it's cooked al-denti (firm) so when making this soup, don't add the macaroni until 25 minutes before serving it. Otherwise, the pasta will continue to cook and turn soft if its left in the pot to simmer further. 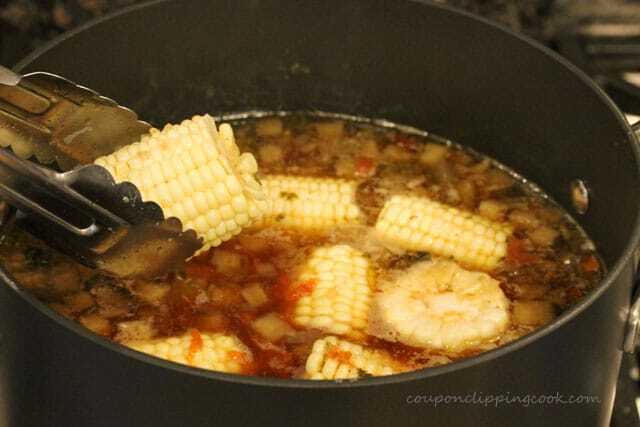 When to add the corn on the cob - About 20 minutes before serving, add the corn on the cob to the pot. Stir occasionally. Serve the soup while warm in serving bowls. Top with slices of avocado, and 1 to 2 pieces of corn on the cob (depending on the size of the serving bowls). 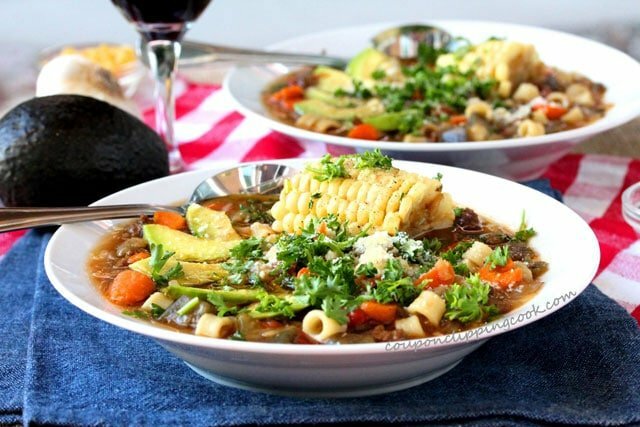 Regarding the Timing of Serving this Soup - The macaroni pasta in this soup which is added at the end tastes best when it's cooked al-denti (firm). 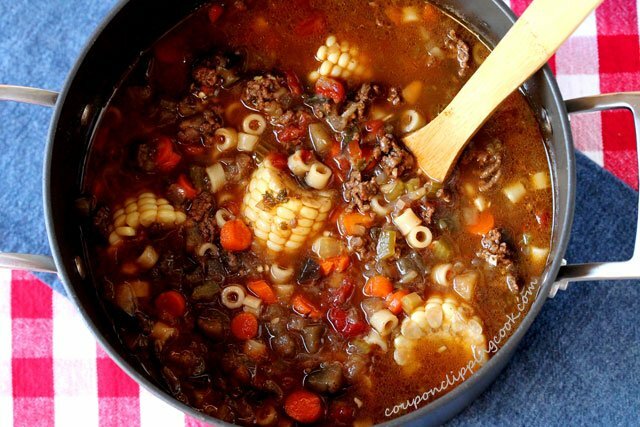 So when making this soup, don't add the macaroni in the soup until 25 minutes before serving it. Otherwise, the pasta will continue to cook and turn soft if its left in the pot to simmer further.